Almost too cute for words, this adorable Aaron Basha charm is from the Baby Shoes collection. 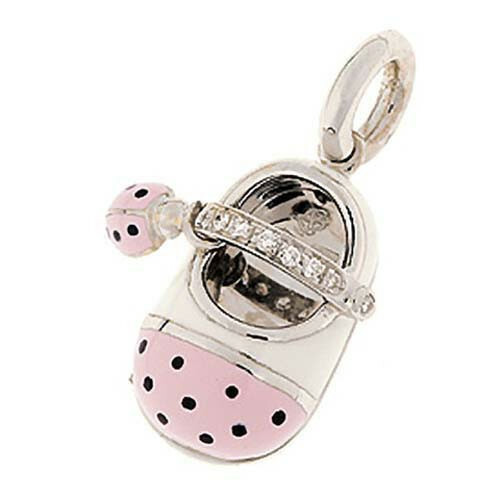 Crafted in an 18kt white gold setting, the back of this baby shoe is finished in white enamel while the shoe's toe is designed with light pink enamel with black polka dots. Luminous white diamonds are fashioned into a brilliant strap where a small ladybug in pink and black enamel dangles graciously off to one side. This is a delightful Aaron Basha charm that will gladly represent the little girl in your life! Engraving is available upon request.